Socrates (470-399 BCE) represents a new beginning in ancient philosophy. He focused attention away from the nature and onto issues connected to the good life and happiness. ⊕ Aristotle calls the genre to which Plato's dialogues belong "Socratic conversations" (Σωκρᾰτικοί λόγοι) (Poetics 1447b). What we know about what Socrates thought we know primarily on the basis of what the character Socrates says in Plato's dialogues. Socrates himself wrote nothing. ⊕ Plato's dialogues have been transmitted from antiquity in their entirety. This is true of the work of no other philosopher in the first two periods of ancient philosophy. Plato uses his name three times in the dialogues. "Adimantus, son of Aristo, whose brother is Plato (Πλάτων) here"(Apology 34a). "Plato here, men of Athens, and Crito and Critobulus, and Aristobulus tell me to propose a fine of thirty minas, saying that they are sureties for it" (Apology 38b). "Plato, I think, was ill" (Phaedo 59b). Plato is the primary witness for Socrates. Others wrote about Socrates, but Plato's early dialogues are traditionally thought to provide the most authoritative account. Keep in mind, though, that since Socrates himself did not record his thought, there is no straightforward way to determine how much the character Socrates (who appears in the Platonic dialogues) resembles the historical figure (who lived and died). There must be some resemblance. Otherwise there would be no reason for the name, but the inference from what the character says to what the historical figure thought is indirect. To clarify the nature of this inference, it is useful to contrast two models for understanding the relationship between Socrates the historical figure and Socrates the character. The apprenticeship model has its basis in the fact that Plato's dialogues read like transcripts of historical conversations. This can encourage the reader to think that Plato is imitating Socrates' conversations in the way that an apprentice imitates the work of his master. The assessment model has its basis in the fact that Socrates was charismatic but also extremely perplexing. On the assessment model, Plato is not trying to imitate Socrates. He is trying to work out what Socrates was trying to say but never succeeded in saying clearly. ⊕ In 399 BCE, Socrates was tried and executed by the city of Athens for impiety and corrupting the youth. The Apology purports to be a record of the trail. I favor the assessment model. Plato's aim is to understand Socrates and to show that it was a mistake for the Athenians to execute him. This is Plato's intent even in the Apology, which is often thought to provide the strongest evidence for what the historical Socrates thought. In 324 CE, after reuniting the Empire, the Roman Emperor Constantine made the city of Byzantium the capital, later known as Constantinople, the "City of Constantine." In the ninth and tenth century CE, manuscripts written in majuscule were rewritten (μεταχαρακτηρισμός, "change of the mark impressed") in the new minuscule. Because the older manuscripts in majuscule were discarded once they were rewritten, the Byzantine manuscripts are the primary link to the dialogues Plato wrote twelve centuries earlier. In Greek palaeography, "majuscules" are large letters and "minuscules" are small letters. Capitals are majuscules made with strokes meeting at angles. They are common on stone or metal, as curves are not easily cut into hard surfaces. Uncials are a modification of capitals to include curves. They are common on soft material such as papyrus in which letters are drawn with a pen. (Here is the fifth letter in the Greek alphabet, epsilon, as a capital, Ε, and as a unical, ∈.) Subsequently, during the fourteenth and fifteenth centuries, knowledge of Plato spread from the Byzantine Empire to Italy and the rest of western Europe. The language of Plato's dialogues is Attic Greek. This is one of the four dialects occur in the earliest records: Attic-Ionic, Aeolic, Arcadian, and Doric. Attic Greek (which is a subdivision of Attic-Ionic) was spoken in Athens, the home of Socrates and Plato. The great literary figures of ancient Greece (including Plato) were Athenian and wrote in the Attic dialect. The Attic dialect became the basis for a common Greek language, called koine (κοινή, from κοινός "common"), which, by the Christian era, was spoken over much the Mediterranean world. It is the language of the New Testament, and through its use in Constantinople, it formed the basis of the language of Byzantine literature. Over time Koine was replaced by other languages of the Mediterranean, primarily Latin in the west and Arabic in the east. Today the Greek spoken in modern Athens is the sole surviving form of the ancient language. The numbers in translations of Plato are called Stephanus numbers. 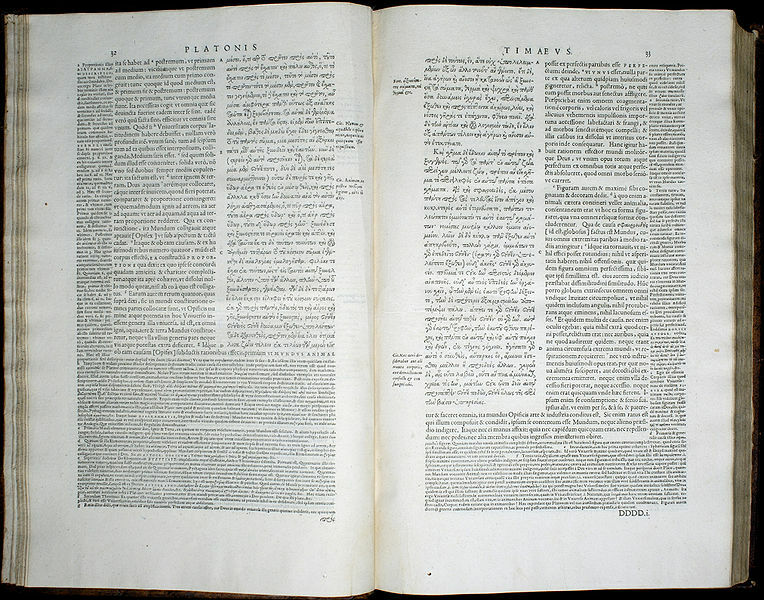 They derive from an edition (in three volumes) published in 1578 by Henri Estienne, whose last name in Latin is "Stephanus." Each page is split into two columns. The inner one is the Greek text. The outer one is a Latin translation. The letters between the columns divide the text into sections. In the image on the right, the book is open to pages 32 and 33 of the Timaeus. In these pages, Timaeus describes the construction of the "cosmos" (κοσμος). The modern edition of the Platonic corpus is John Burnet's Oxford Classical Text. The standard collection of English translations of Plato is Plato. Complete Works edited by John M. Cooper and D. S. Hutchinson (Hackett Publishing Company, 1997). However, it should not be thought automatically that these translations are the best translations available. Translation is not easy, especially for philosophical texts. Translators almost inevitably write some of their interpretation of the philosophy into the text of the translation. For this reason, it is often helpful to look at more than one translation and also to look at older translations whose authors do not always have the same assumptions about what Plato is doing in his dialogues. The first editor of the LSJ, Henry George Liddell (1811-1898), was Dean of Christ Church (a college of the University of Oxford), and the father of Alice Liddell, the eponymous Alice of the writings of Lewis Carroll. In this course, we use the (freely available) translations in the Perseus Digital Library. These translations have some problems, but they are more than good enough for most purposes. The English is linked to the Greek text, and the Greek words are linked to the LSJ Greek-English Lexicon. This allows us to check the translations against Plato's own words. In general, it is not feasible for students to read these dialogues in their entirety in the short time allotted in a one semester course. This is unfortunate. Many of Plato's dialogues are not only important in the history of philosophy, but they are also wonderful pieces of literature in their own right. They are smart and exhibit a sophisticated sense of humor. The selection of the passages that follow constitute the focus in this unit. Read the lectures and return to these passages once it is clearer what is going on the dialogues.